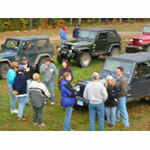 Jeep Jamborees are weekend offroading events that take place in several locations throughout the United States. The events typically include two full days of trail riding (with a variety of difficulty levels being offered in the runs). Jeep Jamborees are organized and run by a company called Jeep Jamboree USA (not Chrysler Corp itself). Jeep Jamborees have been taking place in the USA since 1953 and only Jeep vehicles are allowed to participate in the events.